If you’re looking for a quality set of cookware that won’t break the bank, this set has everything you need. It has a brushed stainless exterior and a polished interior surface, cool-grip handles that are riveted on for security, and tight-fitting lids that self-baste the food as you cook. The triple-ply construction includes an aluminum core for heat retention and even heating. The rims are tapered for easy, mess-free pouring. The set is oven safe to 550 degrees and can be used on any cooking surface, including induction. The pans can also be used under the broiler. All pieces are dishwasher safe for easy cleaning. The set includes a 1 1/2 quart sauce pan with lid, a 3 quart sauce pan with lid, an 8 inch skillet, a 10 inch skillet, a 3 1/2 quart sauté pan with lid, an 8-quart stock pot with lid, and a steamer insert with lid. The only piece you might want to add to this collection is a nonstick skillet for your morning eggs. If you’re ready to replace your inexpensive cookware with a high-end set that will make the neighbors jealous, this set will be the jewels of your kitchen. But it’s not all looks—these pieces are also workhorses that are designed for heavy duty use in your busy kitchen. This set includes all of the pieces you really need in your kitchen: an 8 inch frying pan, a 10 inch frying pan, a 1 1/2 quart sauce pan with lid, a 3 quart sauce pan with lid, a 3 quart sauté pan with lid, and an 8 quart stock pot with lid. These are made with a 5-ply bonded construction that has alternating layers of stainless steel and conductive aluminum for warp-free strength and even heating. The cooking surface has a starburst finish for stick resistance, and the pots have flared rims that make it easy to pour liquid from them. For those days when a recipe calls for a specific pot size and you can’t remember the details of your set, the capacity is etched on the bottom of each piece. The handles are made from stainless steel and secured with flat rivets. Lids are made from stainless steel so you can’t see what’s cooking, but they’re unbreakable and you can use them in the oven along with the pots. These are oven and broiler safe to 600 degrees and can be used on any cooking surface, including induction. They are dishwasher safe, for easy cleaning. Once you own this set, the one thing you might want to add is a nonstick skillet for cooking your morning eggs, but there isn’t much else that you’ll need for most of your cooking. If you don’t have the budget for a high-end set of cookware, this collection will fit your budget while it looks good on your stove. The pans have a mirror finish inside and out, and an encapsulated base for even heat distribution. These can be used on all cooking surfaces. The handles are made from stainless steel, and are riveted on for durability, and the lids are tempered glass, so you can see what’s cooking. The pots are oven safe to 350 degrees and the lids are safe to 270 degrees to preserve their appearance. If you’re not concerned about discoloration of the metal, you can use the pots up to 500 degrees and the lids to 350 degrees. They are dishwasher safe for easy cleaning. The set includes a 1 1/2 quart sauce pan with lid, a 1 1/2 quart casserole with lid, a 2 quart casserole with lid, a 3 quart casserole with lid, a 5 1/2 quart stock pot with lid, and a 10 inch frying pan with lid. While this set includes a variety of pots and pans that are useful, you might be tempted to add a smaller frying pan or a larger stock pot or Dutch oven to your collection. This set ticks all of the important boxes—it includes cookware in sizes you’re likely to use, it’s made from stainless steel that won’t rust or stain or react with acidic foods. It also has a multi-metal base that offers the best heat distribution, retention, and control. The set includes a 1 1/4 quart saucepan with lid, 2 1/2 quart saucepan with lid, a 6 1/2 quart stockpot with lid, an 8-inch French skillet, a 10 1/2 inch French skillet, and a 3 quart sauté pan with lid. The base has a layer of copper enclosed in aluminum and covered with stainless steel that makes it suitable for any cooktop, including induction. The tulip shape looks elegant and the polished exterior adds to the class while the brushed interior hides the inevitable scratches that come from use. The handles are made from cast stainless steel, attached with two rivets for durability, and the domed lids have high loop handles that are easy to grab, even if you’re wearing mitts. The set is oven safe to 500 degrees, and can be used under the broiler. For easy cleaning, all pieces are dishwasher safe. Since the lids are stainless steel rather than glass, you can’t watch what you’re cooking, but it means the lids are also oven safe and are unbreakable. This durable set will last a long time, while looking good. The impact-bonded base provides fast, even heating while the long handles are designed to be ergonomic and to provide a secure grip, even when the pan is full of hot food. The handles are double-riveted for security. There are fill lines inside the pan, so you can add a precise amount of liquid or food without pulling out measuring cups. The covers have straining holes that lime up with the pour spouts, so you can drain your noodles or vegetables without hunting for a strainer. The set includes an 8 inch frying pan, a 10 inch frying pan, a 1 1/2 quart sauce pan with lid, a 2 1/2 quart sauce pan with lid, a 3 quart sauté pan with lid, and a 6 quart stock pot with lid. The lids are made from tempered glass, so you can see what’s cooking. The cookware can be used in the oven or under the broiler, and the pans and lids are dishwasher safe for easy cleaning. If storage space is at a premium, this set nests to fit in the space that’s not much bigger than the largest pot—less than 1/2 cubic foot. These were designed for small kitchens with induction cooktops, like you’d find in RVs and on boats, but they’re just as good for any small kitchen with minimal storage space, whether it’s a new apartment, a tiny home, or a vacation cottage. A bungee cord is included, to keep the pieces neatly together even when the boat hits a storm or the RV is on a bumpy road. These are made from mirror-polished marine-grade stainless steel, and they have encapsulated bottoms for even heat distribution. The set include a 1 1/2 quart sauce pan, a 2 quart sauce pan, a 3 quart sauce pan, a 5 quart stock pot and a 9 1/2 inch sauté pan. Two removable handles and two interchangeable lids are included. 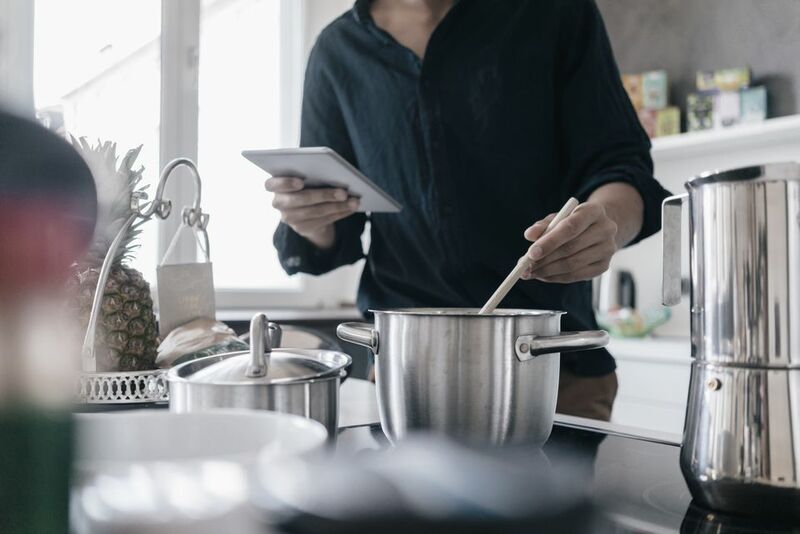 If you usually have more than two pans on the stove at a time, you might want to purchase additional handles so you don’t need to swap them while cooking. There is also a colander available that nests into the set that can be used for straining or for steaming. The obvious missing item in the set is a nonstick frying pan for your morning eggs, but if space is the prime concern, this set has you covered for everything else. These are both oven and dishwasher safe and can be used on any cooktop, including induction. We bought three top-rated stainless steel cookware sets that our reviewers tested for 24 hours. We asked our testers to consider the most important features when using these sets, from the sizes of the pieces to how comfortable the pans are to handle. We’ve outlined the key takeaways here so that you, too, know what to look for when shopping. Number of pieces A large set can give you every pot and pan you could want, and all the pieces will match so they’ll look good on the stove and in the pantry. However, not everyone needs that much cookware — or has enough space to store it — so a smaller set might be a better fit. Cookware sizes Large families will prefer sets with larger pots and pans that can cook all the pasta, burgers, and sauces in a single pot, while small families and singles may not need a giant stockpot and might prefer a smaller frying pan. Lid material Glass lids let you peek at your food while it’s cooking so you won’t lose the heat (and you don’t need to hunt for a potholder). All-metal lids don’t let you watch the cooking process, but they’re likely able to handle more heat, particularly in the oven. Our testers loved the quality, durability, and effectiveness of this stainless steel set. “This All Clad set not only prevents food from sticking, but also cooks the food very well by distributing the heat evenly,” explained one of our reviewers. “After a few weeks, all of the cookware looks great — still shiny and no scratches,” noted one of our testers, who also liked how easily everything stacked together for easy storage. The one downside mentioned was the heaviness of the pieces, but one of our reviewers felt that it was worth it for the quality: “I don't dislike anything really but maybe the weight, but again, I think that is part of the quality of the cookware,” she said.